To create a link to a PDF file which you have uploaded to your site, right click on the displayed link to the document and select 'copy link address'. It is also possible to 'drag and drop' links from the same or another tab or window. Alternatively, use the iframe gadget to embed the PDF viewer directly into the page using the same link as above. Unfortunately you currently have to modify the URL to add the URL parameter "embedded=true" to the end of the document URL. 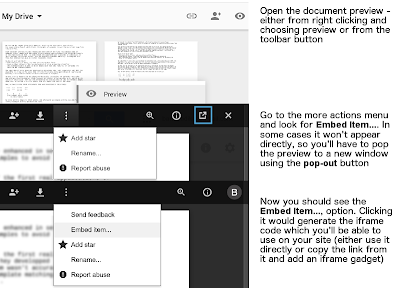 Or you can use Mori's PDF wrapper gadget to embed the PDF into the page as shown below. Click Edit page ► Insert ► More gadgets ► Search: Google Docs Viewer ► Select ► enter the URL. Note: If your file is hosted on a Google Site, copy and enter its Download link and make sure the host Site is public. Customize the gadget Display ► OK ► Save. e.g. - This is the URL of a file stored on Drive found in the embed code for that file. I say this is the 'Quick and Dirty' method because I have been advised that this method may fail in some cases.